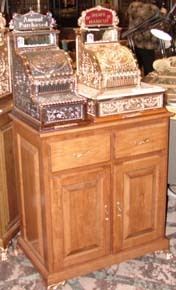 Many years ago, as a service to some of our special customers, our dad built cabinets and stands for displaying their cash registers. 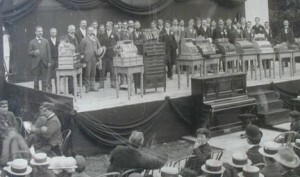 Over the years, the demand for our cabinets has become a stable part of our business. Our dad, who has over forty years experience building fine furniture and has a first-class cabinet shop, personally designs and builds every cabinet we sell. We are fortunate to be located in Western New York State. This part of the state is also part of upper Appalachia, which is home to the best eastern hardwoods. 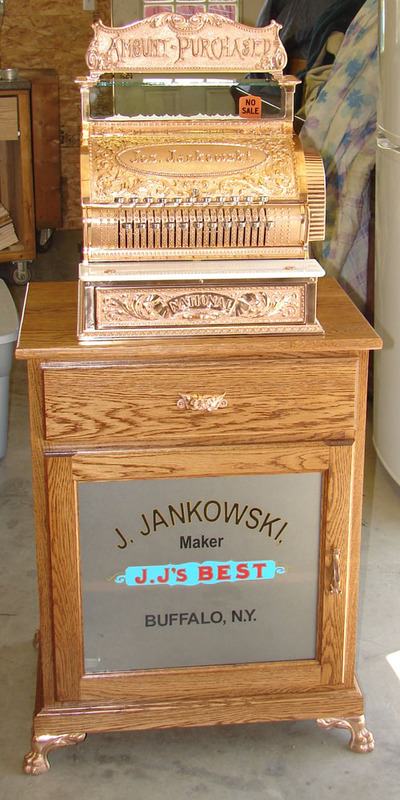 All of our cabinets are constructed of solid hardwood, select grade, kiln dried and purchased from the local Amish. 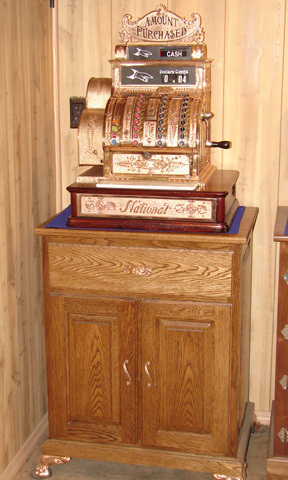 Our standard cabinets are made of white oak, as this was the hardwood of choice used by National Cash Register, and compliments any cash register displayed on it. We can, however, build cabinets out of just about any wood available, including clear ash, cherry, maple and black walnut. 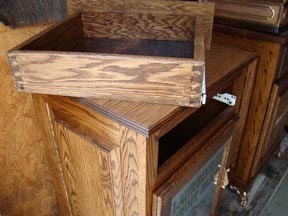 There is no plywood used in our cabinets except on part of the interior adjustable shelf. Our “standard” cabinets are available in three sizes, which can be matched to accommodate just about any size or style of cash register. They are raised-panel construction on all four sides so they do not have to be placed against a wall. 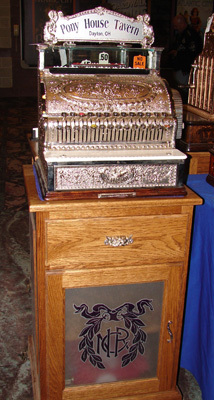 The accents on the registers were designed with cash registers in mind, and are available in brass, nickel or copper-oxidized finishes. 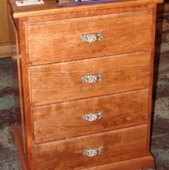 The cabinets feature dove-tailed drawers and the best European hinges and drawer slides. We believe that the hardware has to be as durable and nice as the cabinet, so the doors and drawers all have the “soft-close” feature. 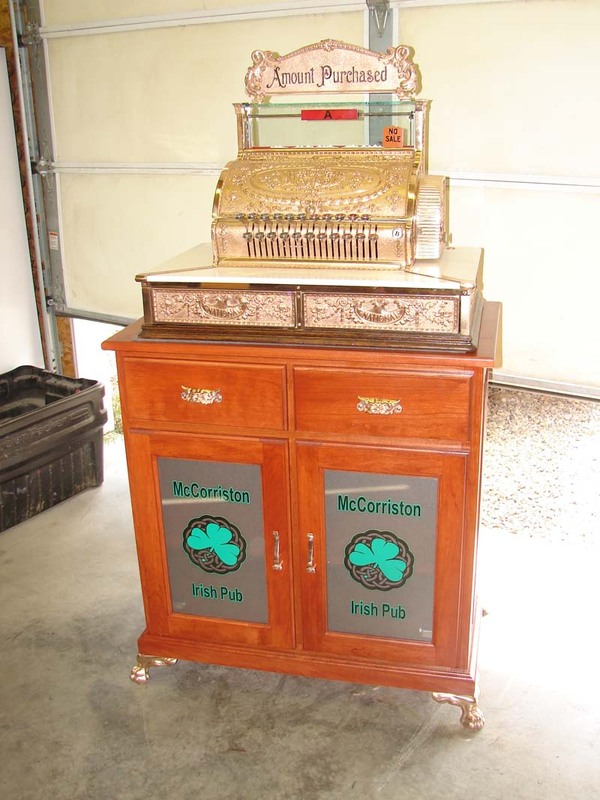 In addition, their heavy-duty construction and beautiful, but durable, finish make them not only ideal for cash registers, but the absolute perfect stand for a slot machines or any other treasured antique. And since these cabinets are custom made, we can match the cabinet to your décor. 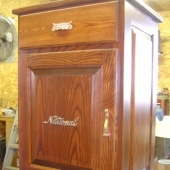 If you would like a sample of the wood and color of the style cabinet you would like, please call us and we will be happy to supply one — serious inquiries only, please. We ship the smaller stands in heavy-duty boxes, and they will ship anywhere in the continental U.S. for $75.00 via FedEx Ground. Shipping the larger stands (over 18″ wide) require shipment via FedEx Freight. We get excellent rates through FedEx freight, so if you are interested in one of the large cabinets, please contact us for a shipping quote. Delivery within a reasonable distance from our location in Western New York State may also be available. 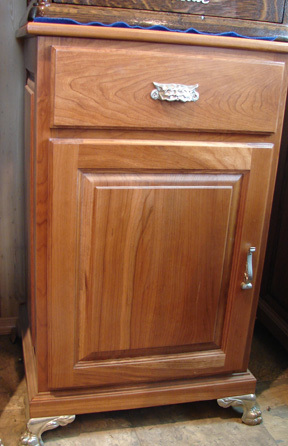 We have listed a number of cabinets that we currently have available for immediate shipment. 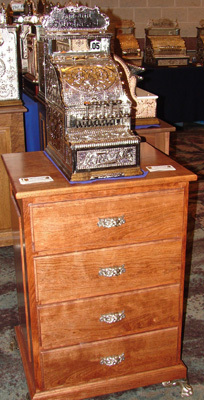 We have also featured examples of cabinets that we have available, but can take four to six weeks to manufacture. Please call us at 607-792-3343 or e-mail us at info@hbacgroup.com for more information. The dimensions of these cabinets are 17" wide by 17" deep by 34" high. These cabinets are just a bit smaller than our standard size cabinet, designed to display the smaller candy-store style registers. The cabinet can be made with either a custom glass door or a raised-panel door. The price of this cabinet starts at $1,000 for the solid oak cabinet. 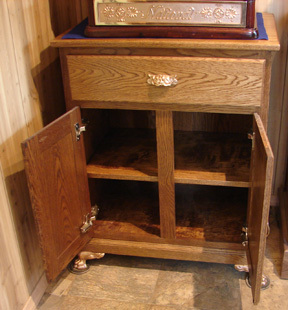 The cabinet pictured is available for immediate shipment, and can be customized with either brass or nickel accents. 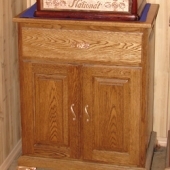 This solid oak cabinet is the standard size cabinet that fits most registers. The dimensions of these cabinets are 20" wide by 17" deep by 34" high. 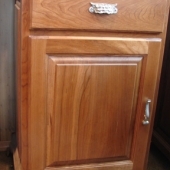 This cabinet has a raised-panel door with brass or nickel accents. 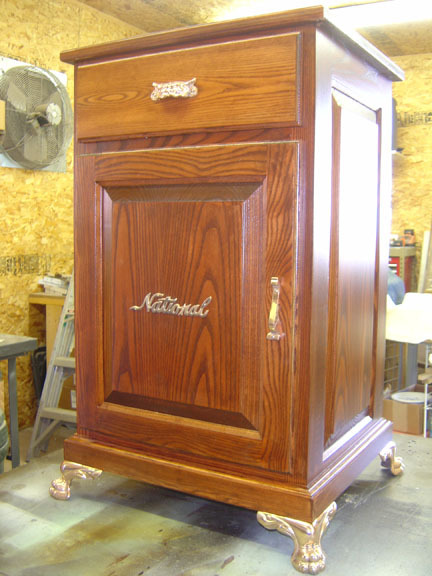 As with all of our cabinets, regardless of style or wood choice, you will not find a better piece of furniture. The price of this cabinet starts at $1,000 for the oak cabinet. 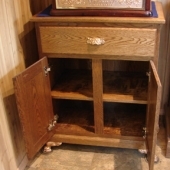 This cabinet is available for immediate shipment. 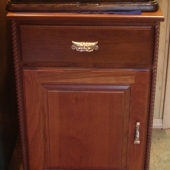 This cabinet is perfect for a model 452, or for someone who wants the cabinet just a bit larger to display their register or slot machine. The register that is displayed on this cabinet is 18" wide. 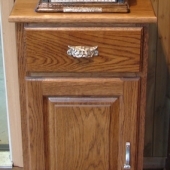 The oak cabinet is 26" wide by 18" deep by 34" tall. 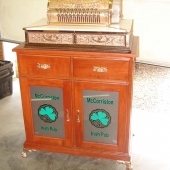 It has raised panels on all four sides and is available with nickel accents. PRICE: $1,100. 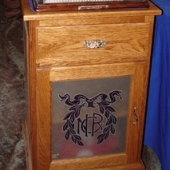 Here is a photograph of the oak cabinet with two doors with the doors opened. 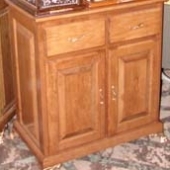 Below is a gallery of cabinets that we have custom made. Please click on the photograph for a larger image and description of each cabinet.